New research by Dr Graham Oliver, staff at RAMM and at the Natural History Museum, London has identified type and potential type material in shell collections once belonging to Colonel George Montagu. Colonel George Montagu (1753-1815) is one of the British naturalists who established the foundation of modern scientific study. Montagu identified many British animal species for the first time. He was also among the earliest members of the Linnean Society. Linnean Society is one of the world’s leading organisations for the study of natural history. His particular interests included marine biology and ornithology and the common names of several animal species bear his name: Montagu’s blenny, harrier, ray, sucker, and sea snail. 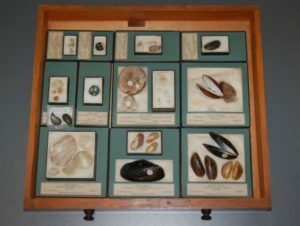 In November 1874 Montagu’s natural son, Henry D’Orville, donated some of his shell collection to RAMM. The Natural History Museum in London also holds a small number of Montagu’s shells. Both collections include type material. It is also possible that some have found their way to a museum in Washington, USA. RAMM’s collections contain other type material too. Two new reviews of Montagu’s mollusc types and other notable specimens are available online. These papers are open access and available to download free of charge. Oliver PG, Morgenroth H, Salvador A (2017) Type specimens of Mollusca described by Col. George Montagu in the Royal Albert Memorial Museum & Art Gallery, Exeter and The Natural History Museum, London. Zoosystematics and Evolution 93(2): 363-412. Oliver PG, Morgenroth H (2018) Additional Type and other Notable specimens of Mollusca from the Montagu Collection in the Royal Albert Memorial Museum & Art Gallery, Exeter. Zoosystematics and Evolution 94(2): 281-303. The authors were unable to locate all type mollusc material associated with Montagu. It may be in other UK museum collections (and possibly around the globe). Please contact the authors if you suspect you know the location of additional material. 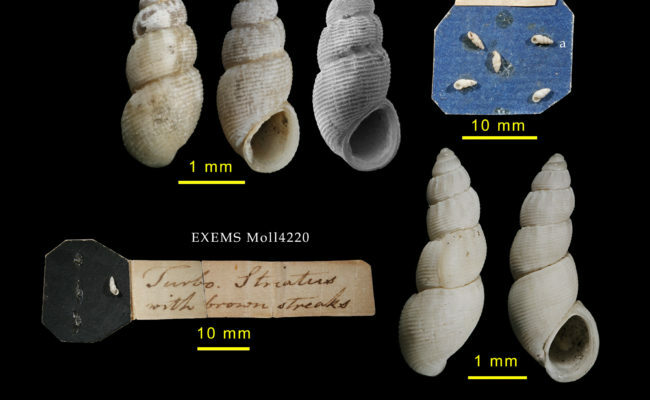 This research is part of a much larger project by Amgueddfa Cymru – National Museum Wales and the Natural History Museum to catalogue mollusc type specimens in UK collections. The project is supported by the John Ellerman Foundation. The Mollusca Types in Great Britain database can be viewed online. Posted in Research Collection by Holly Morgenroth on November 17th, 2017.